I’m curious… How successful was your last leaflet campaign? Did it pull in the leads, boost enquiries, and help grow your business? If the answer is a resounding ‘no’ to all three questions, then clearly something was awry. And that is actually fair enough. Producing effective leaflets is no easy task. It requires careful crafting to compel a customer to take action from reading a leaflet – if they even bother to read it in the first place! Creating the words for your leaflet can be trickier than you think. So to help you get clear on the most common content stumbling blocks, here’s a list of eight common mistakes. So take a quick read and discover the pitfalls to avoid when you next use this classic marketing tool. If you try and appeal to everyone, you’ll end up appealing to no one. Unless you sell a mass-market product or service (and you have a bottomless marketing budget! ), you need to decide who you want to attract with your leaflet specifically. What problems might they have that your business could help solve? What objections will stop them investing in your product? It’s no good presenting general information about your company on your leaflet. This information DOES NOT lead to the sale! For example, if your business is an outdoor retailer it’s not a compelling message to state that you’re the market leading retailer with a range of incredible offers. So what? Instead, think back to what your target customers is after and then hone in on one, specific thing. Let’s say you’re targeting families who are planning a camping trip in the summer. Instead of promoting the full range of equipment, perhaps run an offer on tents – then once the customer is in-store, you can always upsell to other essentials. Too many leaflets focus on the actual product (or service) details, or give too much information about the company. First and foremost, customers don’t care about the specifics of what you’re offer. This type of information appeals to the logical brain – and we make buying decisions based on emotion. That’s why you need to explain how your customer will benefit from your offer. In the example of tents, it’s far more compelling to talk about tents that are weatherproof, durable, spacious, and easily assembled as opposed to the technicalities of the design. After all, your customer wants to feel confident that their choice will lead to a happy, successful holiday. So focus on what’s really important – not the number of poles! Even if you’ve made a specific offer to a target market, if there’s no impetus on the customer to take action NOW, the likelihood is they won’t. We’ve all experienced ‘customer inertia’ – you read an interesting offer and file it away to consider later. But later never happens!! The way to overcome this challenge is to create an incentive for the customer to do something NOW – and that’s the power of a deadline. By putting a fixed timescale on your offer, it can be just enough to convince for your reader to become a customer – simply because they don’t want to miss out. If your reader doesn’t know exactly what they have to do next to take advantage of your offer, there’s a good chance they’ll do nothing! The offer might be great (and it may have a clear deadline), but you still need to spell out the next step. This might be to make a phone call or visit your store or website. Either way, provide all the details necessary to make it easy for the customer to act. This measure may seem blindingly obvious to you, but you have to remember that not everyone will read your words in as much detail as you. Most will scan and skip their way through your content so if the call to action is too subtle, there’s a very real risk it will be missed. A 10% discount is boring and predictable and definitely overused! How can you make your offer a no-brainer? Again, you need to think about your target customer and tempt them with something that makes them tick – and buy. If you’re making claims, you need to be able to back them up. The customer won’t believe it when you say your product/service is the best in class! So instead provide social proof in the from of testimonials and third-party endorsements to support your claims. Remember. The words of others are far more powerful than anything you can say yourself. Want to feel confident writing a leaflet to promote your latest offer or new product? Get your printed copy here: click here to get started today! Your leaflet could be hitting all the right notes, but if you have no way of linking sales or enquiries to it, you’ll be none the wiser! As a result, make sure you can track sales and enquiries to your leaflet. For example, you could ask the customer to quote a reference number from the leaflet or include a tracking number that’s specific to this particular campaign. Whatever system you use, it will help you evaluate your leaflet campaign’s results. Then looking forward, you can replicate what works and ditch what doesn’t. To save you time (and headaches), I’ve condensed my many years of copywriting (and teaching) experience into a step by step, 44-page workbook. This comprehensive, printed workbook takes you through the whole process of producing compelling content for your leaflets. You’ll find the process easy to follow – and logical too. In fact, it’s the next best thing to having me sat by your side guiding you through the creation process. 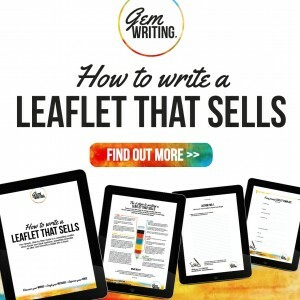 How to Write A Leaflet That Sells is your DIY guide to creating a truly effective marketing leaflet. Your investment is small – just £35 (+£3 P&P). This price is A LOT less than working directly with me and will save you hours of work because it will channel your thinking (and writing), very carefully. To get your hands on this essential kit, just check out using PayPal by clicking the button below. You never know, you could find that with this workbook by your side, you enjoy the process of writing 🙂 And if you have any questions, please pop them in the comments below.